If it's not extremely easy, people won't do it. The benefits of recycling seem straightforward. The practice reduces waste sent to landfills, conserves natural resources, reduces pollution and creates jobs. And the majority of Americans do recycle... sometimes. Far fewer, however, do it consistently. Indeed, according to a 2011 Ipsos Public Affairs survey, only half of adults recycle daily. Another third of respondents said they recycle less frequently than that, and a full 13 percent revealed that they never recycle. Because the reward for recycling (saving the earth) and the repercussions for infrequently recycling (damaging the environment) aren’t necessarily immediate, it can be hard for people to make the association between their daily habits and those habits’ consequences. Nolan, who previously worked as a municipal recycling director and who researches environmental problems from a social perspective, said that identifying a community’s barriers to recycling is an important first step toward increasing participation. The primary excuse people gave for not recycling was that recycling wasn’t convenient or accessible to them. According to The Economist, about a quarter of Americans don’t have access to curbside recycling, meaning they have to take the extra step of dropping their cans and bottles at a recycling center if they want to participate. Of course, how people answer a survey isn’t necessarily a reliable indicator of whether or not services are available to them. 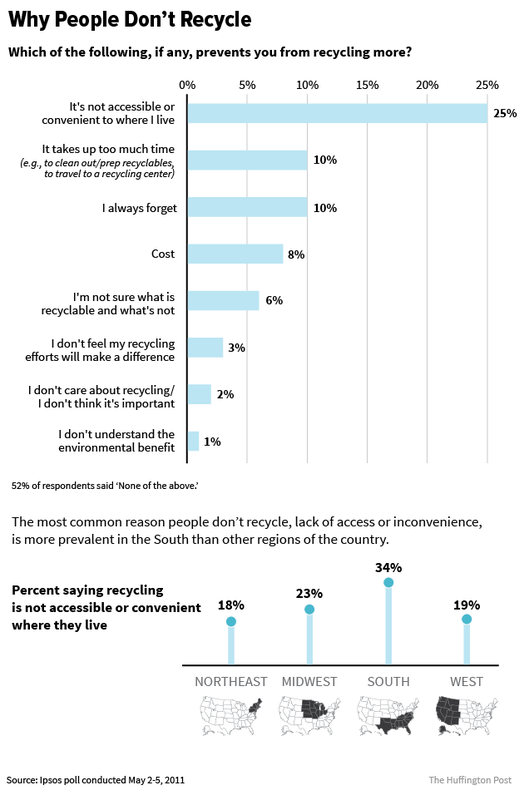 While doing an informal survey of college students in Arkansas, Nolan noticed that individuals from the same town sometimes answered differently about whether or not a recycling program existed in their hometown. The excuse: Recycling is inconvenient, time-consuming or too costly. The experts say: Iacoviello thinks the crude cost-benefit analysis people do when evaluating recycling’s benefit to them emphasizes the immediate over the long term. The cost of recycling “is seen and felt more immediately than the cost to the environment of not recycling, which is why it influences behavior more,” he explained. Those who think recycling is inconvenient may be doing a similar cost-benefit analysis of how much time recycling takes compared to how easy they perceive the activity to be. Targeted intervention: Structural solutions are fundamental to getting more people to participate in environment efforts, according to Nolan. If, for example, citizens say their town’s drop off program is inconvenient, instituting a curbside program could improve recycling recycling participation rates. Rural communities may need to think more creatively; Nolan suggested partnerships with grocery stores, convenient drop-off sites because people are already visiting them. The excuse: Isn’t sure what’s recyclable and what’s not; doesn’t understand recycling’s benefit. The experts say: Recycling can be confusing. It differs from community to community and rules about recycling have changed over time. “There’s always that tension between getting people to participate and making sure you end up with a product, rather than just a waste stream,” Nolan said. Targeted intervention: Uniform educational materials across communities could help eliminate confusion, even if those communities accept different materials as recyclable. Penalties for not recycling are especially effective at encouraging people to learn their cities’ recycling rules. San Francisco, for example, has made strides by making recycling mandatory and fining citizens, building owners and businesses who don’t separate their trash, recycling and compost materials. Today the city has the highest landfill diversion rate in the country, and diverts 80 percent of its waste away from landfills, with a goal of eliminating waste entirely by 2020. The excuse: Believes recycling doesn’t makes a difference, isn’t important or is a low priority (”always forgets” to recycle). The experts say: Despite tangible evidence to the contrary, some respondents still said they didn’t think recycling makes a difference. That’s an indication there’s a key disconnect between communities and recycling advocates, according to Suparna Rajaram, a psychology professor and director of the social memory and cognition lab at Stony Brook University. Other responders say “they always forget” to recycle, another indication that recycling is a low priority for them. Targeted intervention: Rajaram says it’s not just important that people know how to recycle correctly. They also need information about how their recycling efforts directly affect their community. “Reward can reinforce action,” she said, noting that a reward needn’t be personal. It could be as simple as well-circulated information about the tangible benefits of high participation in community recycling programs.